School’s out, summer is here, but I’m still busy! How does this happen? I didn’t have a nap. What is happening with all the critters and chaos around here? We currently have 2 dogs, 2 cats, and 5 kids, ranging from 11 down to 2, with another due in December. Impending baby takes up a big part of my thoughts, and honestly, my energy. I’m not normally the sort who needs a nap in the afternoon. A baby on the way also mean I must plan. I’m not very good at planning. Homeschool needs to be planned out earlier, so we can start a little earlier. Meals must be planned, because no one wants to eat default meals for the next 6 months. My days need planned, because if I don’t, I run out of vim before I run out of day. Baby is a rainbow baby, that is, a baby coming after a miscarried baby. My miscarriage was last fall, and my heart didn’t heal as quickly as my body. I still find myself running up against walls and fears that I didn’t before. I find it frustrating, but I struggle with how to help it heal completely. Can it heal completely? For the first 12 weeks of this pregnancy, I checked for blood every time I went to the bathroom. Finally, when I thought I could relax a little, blood showed up at 14 weeks, followed by days of brown spotting. After tests and an ultrasound, I was diagnosed with a subchorionic bleed. It’s a bleed between the placenta and the wall of the uterus. It slightly increases my risk of miscarriage and placenta abruption. So much for relaxing in the 2nd trimester! The risk is slight, though, and they can easily monitor the bleed site to see how it heals. With their school year finished, the kids have started swimming lessons and the summer STEAM program at our local schools. The Ballerina (11), the Engineer (9), and Miss Bug (7) have lessons and STEAM every week day. Curlytop (4) and Little Bird (2) play in the baby pool during the lessons, and have time with Mom each afternoon without the big kids. In theory, there will be potty training and alphabet lessons starting during that time. In reality, we’ll see where my energy levels are. Although fall seems far away, It’s time to plan what textbooks I need to buy for the coming year. 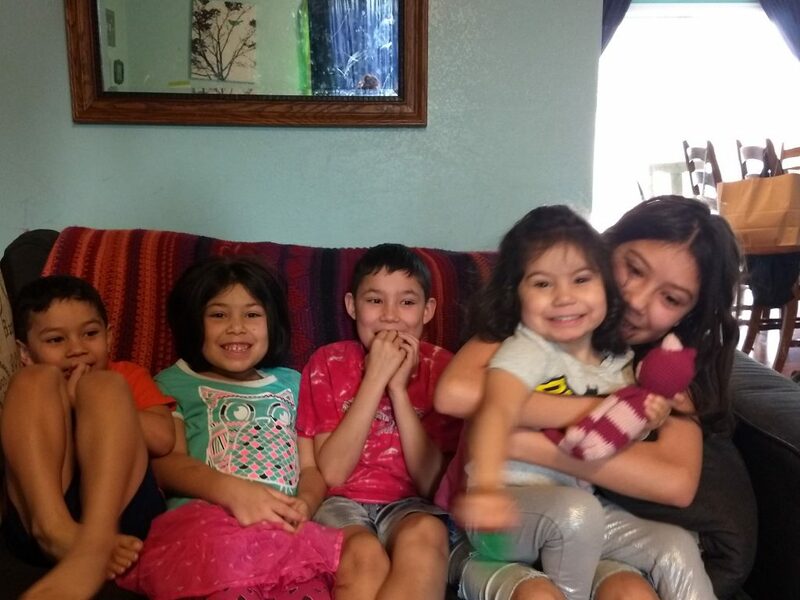 I’ll have a kindergartner, 2nd grader, 4th grader, and 6th grader. For the Ballerina, entering 6th grade, we will be trying Kolbe Academy, an accredited Catholic homeschool program that will, I think, fit her needs. She’s ready to work more independently now, and I’m ready to let her. The exact moment we told them they had a baby sibling coming this Christmas. My parents will be moving soon, selling their house in the country (my childhood home) and moving to a smaller, one-level place a few blocks away from us. I love that they will be closer, but I’m also surprised at how emotional it was to visit their old place these past few weeks. My family has lived there since I was 2–39 years of memories and experiences. All my old pets are buried there (sorry if that’s creepy, but it is in the country; it’s not like they’re buried beside the house). It has the best sledding hill out back. We will miss it. I will miss it, for all that it was just a spec house thrown up during the power plant boom. The fact that they’re moving means my husband’s big welding machine, which used to live in in their huge detached garage, is now living in our smaller, attached garage. Although people joke about exiling the husband to the garage, mine keeps disappearing out there to brush up on his welding skills. The Ballerina and Engineer can’t wait till they can learn to weld too. (Send us scrap metal). Somewhere in that, I’m finding time to work on a novel. I wrote on many years ago, just before the Ballerina was born. It took me 5 years, 5 rewrites, and I have 81 rejection letters for it, but I learned a huge amount about writing to apply to this novel. I’m 85,000 words in on a story I hope won’t top 120,000. Because I can’t stand to have my fingers idle, I am also working on crocheted dolls as birthday gifts for Miss Bug’s friends. Their birthdays aren’t till fall, but I don’t dare put them off. Just the hair cap on one doll took 5 hours of work. Yup, that hair took 5 hours, and it isn’t quite finished because I ran out of yarn! 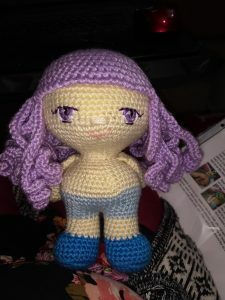 The pattern is a Weebee doll by Laura Teggs and can be found on Ravelry. That’s what happening in our house this week. What about you? 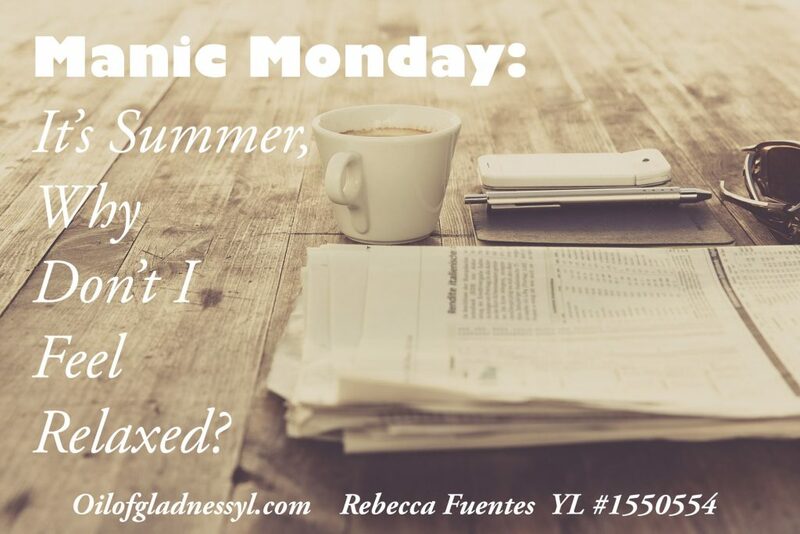 How manic is your Monday? Next Post Is Sunscreen THAT Scary?